On Monday the 27th of October, 2014 we exercise our right to vote for our representative in local council. Often municipal elections are seen as far less exciting then federal or provincial elections and subsequently voter turn out can be quite low. Voter turnout in Kitchener municipal elections can range between 23-60%. Our last municipal election in 2010 had a voter turnout of only 27.41%. Is voting in a municipal election important? Without question voting in a municipal election is extremely important. It is our way of exercising our fundamental right of democracy. Votes cast determine who our elected representatives are and who will enact policies and laws that will shape the future of our city and its internal communities. Our votes in a municipal election directly impact the quality of life in our community. The municipal council make decisions about crucial elements of our daily lives. Voting impacts the growth and sustainability of our community. It is our opportunity to send a message on how we want our community governed. Voting shapes our neighbourhood. If you care about your community, it is so important for voters to become informed and take the time to cast a ballot and vote. It is our way of making our voice heard and turning opinion into action. 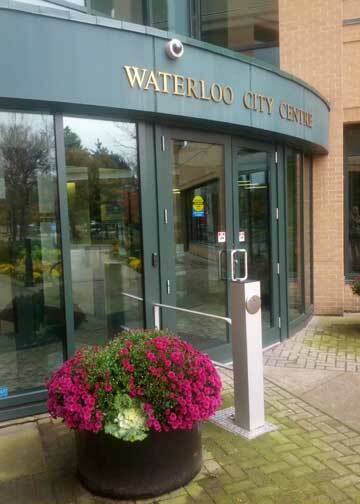 The Kitchener City Council is comprised of 1 mayor and 10 city councillors representing the 10 wards within the area. All city councillors are elected for a four year term. The mayor is elected by voters from across the city and councillors are elected by voters with in the specific wards. An elected councillor makes decisions on issues facing the city and its residents as well as day to day operational business. These decisions are based on important information presented by city staff as well as their own knowledge and beliefs and the opinions expressed by their own constituents. Find out about who is running for city councillor in your ward and exercise your right to be heard. Your elected representative in council is nonpartisan so he or she is not affiliated with a specific political party. Councillors and Mayors make decisions and work based on their constituents needs and desires, unlike provincial or federal politicians who must adhere to the party line. If you wish to voice a concern about your community, your counsillor is there for you. All you need to do is call City Hall and ask to speak to him or her. If you want a better and vibrant local community, don’t just sit around and complain. Vote for the person who represents you and your beliefs. Your vote is your voice, make it heard and turn opinion into action. Every Vote Counts!